Powell Springs Campground was developed by the Civilian Conservation Corps (CCC) in the 1930's. There is room for RV's but with no hookups. The landing pads for RV camping are dirt as is the rest of the campground. 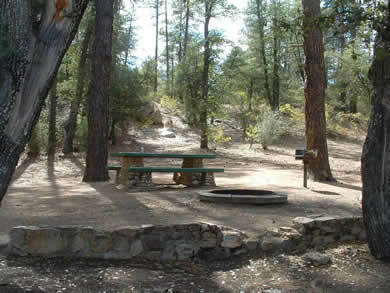 Group camping is available call 928-567-4121 for reservations. There are many differents natural springs flowing in the area such as: Walnut, Medlar, Log, Blue Monster, Tunnel, Bunker, Slide Rock, Goat Peak, lyon and Horse just to name a few. The mining town of Cherry is nearby, although there are no services there. 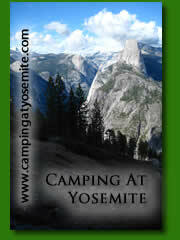 There are no fees to camp here and sites are on a first come first served basis. Each site usually accomodates one vehicle towing a traielr and room for another vehicle. Vehicles must park in the space provided. Do not park along the side of the road. Campsites are designed for 5 people but can accomodate up to 10. In Camp Verde, take I-17 south approx 8 miles to Exit 278 (SR. 169). At end of exit ramp, turn right onto Rt. 169 (west) and travel 5.5 miles to the Cherry Road sign (Forest Rt. 372). Turn right onto Rt. 372 (dirt) and travel 4.5 miles to campground sign. Turn left at sign into the campground. 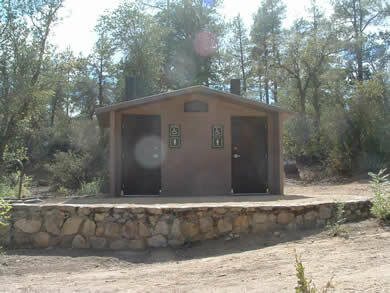 Above: The restroom facilites at Powell Springs.